Democracy was unkind to the inner city. Post-1994 saw big business make tracks to the suburbs and, as resources stretched to incorporate previously underfunded parts of Johannesburg, neglect set in. Despite that, thousands flocked here in search of work and in desperation for accommodation that came coupled with absent or greedy landlords and a spike in crime. It created a toxic combination. Streets once highly valued on the Monopoly Board became no-go areas. But thinking back, Joburg was never a tourist city. 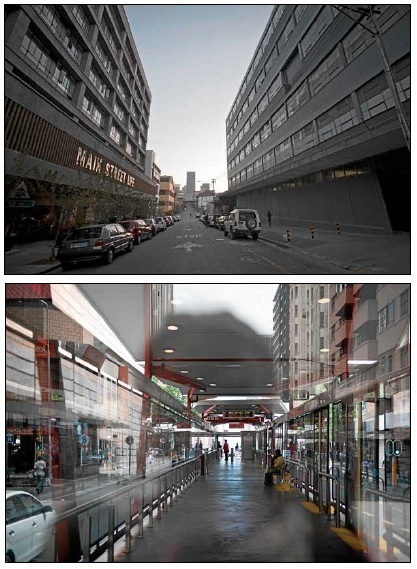 Apartheid stunted its growth, creating a place where people mostly came to work or shop by day. And besides, South Africa’s pariah status coincided with the emergence of modern tourism, so at a time when foreign destinations became more accessible via air travel, Johannesburg was the city to boycott. When the country did open up it was our natural attractions that were advertised to the world, leaving bikini-clad Cape Town in a more fortunate position. Added to that the idea of “urban tourism” is relatively new. Joburg Tourism’s Laura Vercueil says a recent development is that the city is now partnering with Cape Town and Durban to promote that aspect of tourism to the world. I asked Professor Keith Beavon, an urban geographer with encyclopaedic knowledge of Joburg’s past, what makes a tourist city? It is notable that much of the talk about the city’s tourism potential is centred on its contemporariness rather than its history; a good cappuccino can do wonders for a city’s image. It’s also unsurprising considering the city’s sensibility – or as Beavon terms it, its “mining camp mentality” – it “doesn’t look backwards – only forward”. By comparison to the world’s major cities, Joburg’s mere 125- year history makes it, he says, little more than an “embryo”. Isaac Chalumbira, the owner of Reef Hotel on Anderson Street, one of four four-star city hotels, spearheaded the move to create the new tourism association. “The city has done a fabulous job in building the hardware,” Chalumbira says. “We have the Johannesburg Development Agency to thank for major infrastructure that we see today – public transport in the Rea Vaya network, cleaner and safer streets, new districts.” The challenge, he says, is to create the “software” – attractions that will draw people to stay and play in the city, and stitch everyone’s efforts together so that it all makes sense to visitors. It’s a fresh start for the city after some false starts. A few years ago the marketing preceded the goods with luxury apartments being sold at a time when the lack of city life amenities – transport, walkable streets, a grocery store and yes, a coffee shop – meant you were buying an oasis but still needed a camel. This time is palpably different. “It’s a cooperative effort”, says Chalumbira: a coalescence of developments that include upgraded infrastructure, residential apartments catering to various budgets, an inner-city transport network – the Rea Vaya – conference facilities that are drawing business tourists, parks and pedestrian malls. The city has also been given the thumbs-up by some major brands including Puma, who have added to their street cred by opening a store in Braamfontein. Another sign of endorsement is the planned January launch of the Hop On-Hop Off bus with around 12 city stops (starting and finishing at Park Station so accessible from any point on the Gautrain line). For Chalumbira, Braamfontein on a Saturday afternoon is as good as it gets. “I’ve watched people at the Neighbourgoods Market just absorbing the city”. “They are doing absolutely nothing but socialising,” he says. “They are 25-year-olds who have been to New York City – and see no difference”. One of the challenges, he admits, will be creating consistency in the cycle of the city’s weekly life, transforming it from a working city to one that is appealing on any day or night, with street life, night life and weekend attractions – this is already happening in Braamfontein and Maboneng. Chalumbira says hotels and restaurants in the financial district plan to stay open until late on Saturdays for the next few months. And Chalumbira isn’t just a talker – he is planning to move back into the city, having recently secured an apartment in the opulent The Franklin Building on Pritchard Street. He says he lived in the Mapungubwe Hotel on Anderson Street (one of the first new city hotels and home to its sexiest bar -in the vault of what was once the French Bank) for three months with his two children, and his kids still ask: When are we going back? 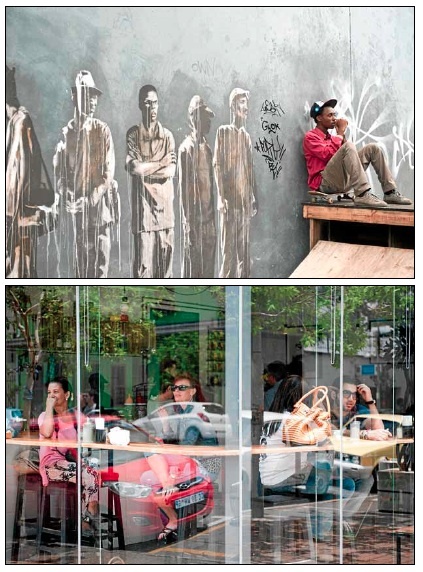 It’s a view echoed by Maboneng developer Jonathan Liebmann, who returned to Johannesburg after travelling the world, took one look at suburban life and fled in search of the city. That was the start of Arts on Main, in 2008, when Liebmann’s property company Propertuity bought what was once DF Corlett’s (Corlett was the city’s mayor in the early 1930’s) offices and warehouses on the city’s eastern side. “Having been a tourist in many countries I thought: how do I create an environment that works for me? As a tourist I was looking for an authentic multi-layered experience”. 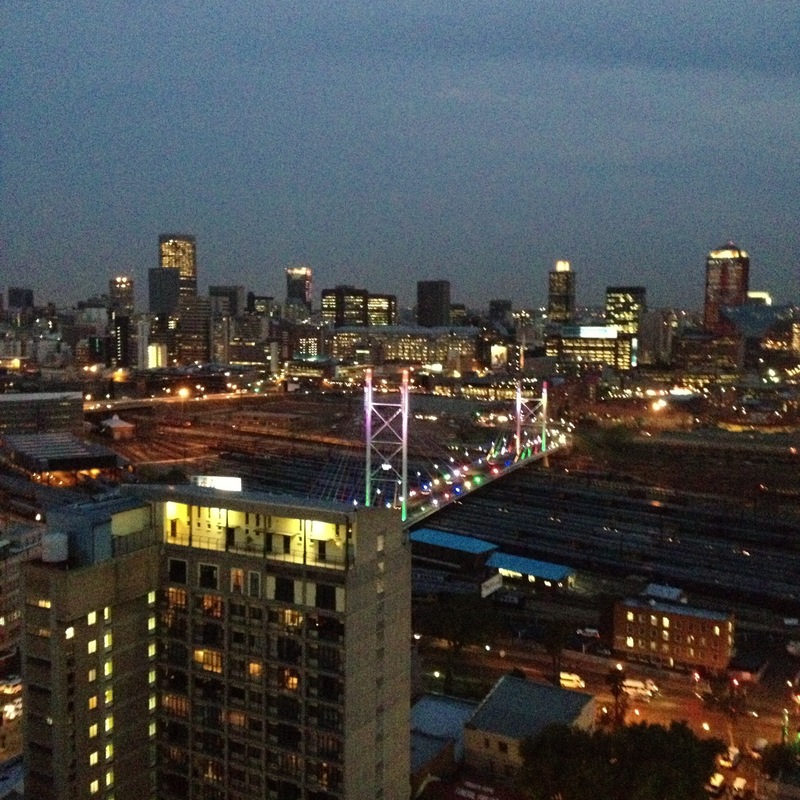 It’s this view that informed the development of Maboneng, his idea for a multi-use, integrated city neighbourhood. And where the global tourists have ventured the world’s media has followed. A recent article in US fashion bible W magazine – billed Joburg as the “Capital of Cool”, “Africa’s hippest hub for art, music and fashion” while the New York Times labelled Braamfontein as the “South African version of Brooklyn’s Williamsburg or London’s East End”. Liebmann estimates Maboneng gets around 5 000 weekend visitors, putting it down to the fact that it offers “people the opportunity to walk the street”. Maboneng is set for major expansion, with plans to be launched next month. With a cinema, theatre, food market and museum, it already has put together some shiny attractions. “People complain about the government but there are major opportunities in the gaps,” he says. In Ameshoff Street, in Braamfontein, you’ll find Jamie Lorge, a poster child for this new spirit inhabiting the city. Her eatery Love Food has only been open for a few weeks but it’s packed at lunchtime. Originally from Knysna, the 24-year old has lived in Cape Town – where she trained as a chef at Silwood Kitchen – and in London. “I knew I always wanted a place,” says Lorge. “I nearly signed in [the northern suburbs] Melrose Arch, then Parkhurst. Then I came to the Neighbourgoods Market one Saturday and saw a to let sign. I thought the place needed something like this”. The “this” is an urban café, a bright spot in Braamfontein with delicious fresh food at reasonable prices. “I want to give people a reason to come out of their offices,” she says. “Give this area two years and it will be like City Bowl in CT. People don’t yet understand just how beautiful Joburg is”. A few blocks down, Andrew Bannister’s Metro Hotel is undergoing a renovation. Soon to be renamed The Bannister, the hotel caters for cross-border traders. Joburg is a major shopping destination on the continent. South Point’s Talotta calls it’s “the Dubai of Africa”, except with real cultural attractions. “The hotels and tourism infrastructure are cheaper and so are all the designer labels that you’ll find in Paris or London”, he adds. From the deck of Randlords the city appears coherent, and neatly arranged. As the sunset begins to fade, it is bathed in pinkish hues with a skyline good enough to wear on a T-shirt. At opposite ends of the city Braamfontein and the Maboneng district are two of Joburg’s rising stars but there are other success stories – the Financial District, the developments along Main Street, Gandhi Square, the Fashion District, Constitution Hill and Little Addis – the Ethiopian District. The association has its work cut out for it but it is clear that for the first time in years Joburg as a tourist destination will rely more on the ability to connect the dots and tell people about them, than it will on creating them. * This story first appeared in the Mail&Guardian November 1, 2012. This entry was posted in food, hotel, Johannesburg, travel and tagged Anderson Street, Andrew Bannister, Braamfontein, Gauteng, Hospitality/Recreation, Hotel Lamunu, Isaac Chalumbira, Jamie Lorge, Joburg City Tourism Association, Joburg Tourism, Johannesburg, Johannesburg Gauteng, Johannesburg-Development-Agency, Jonathan Liebmann, Josef Talotta, Keith Beavon, Laura Vercueil, mapungubwe-hotel, Museum Africa, Park Station, Propertuity, Reef Hotel, South Africa, The Franklin Building by lauricetb. Bookmark the permalink.